A 58 year old gentleman undergoes core biopsy of a palpable, rubbery, 2.1 cm breast mass. 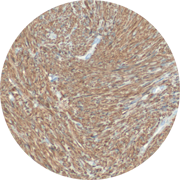 Sections demonstrate intersecting fascicles of bland spindle cells, without atypia or necrosis. Mitotic figures are not conspicuous and breast ducts are not seen in the examined sections. Immunoperoxidase stains are uniformly positive for SMA and focally positive for desmin. Immunostains for pancytokeratin, Cam 5.2, CD34, p63, and S100 protein are negative. A diagnosis of leiomyoma is rendered.